This past week I made my first loaf of pumpkin bread for the season. In a world of pumpkin-spiced beer... pumpkin-spiced M&M's... pumpkin-spiced lattes... and etc., plain old pumpkin bread is a relief. 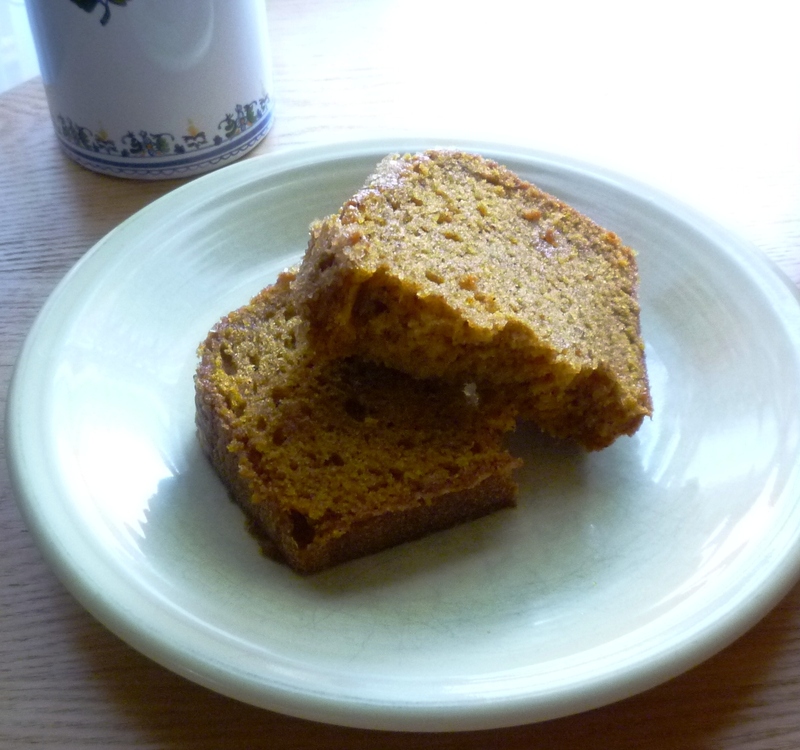 It is so ordinary and simple that anyone can make it...and I am convinced that its nostalgic sweetness and spice are the qualities that the pumpkin spice-food makers of the world are trying to emulate. From now through the end of the winter months I will almost always have a few slices tucked away in the freezer (for breakfast...or a snack)...along with a loaf or two to give as impromptu gifts. 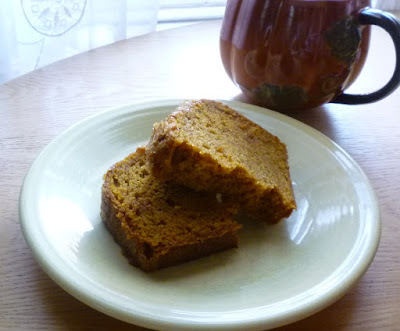 I have had more than one recipient tell me that it is the best pumpkin bread they have ever had. My recipe is not fancy. In terms of the major ingredients and mixing method, it probably varies only slightly from many recipes you will find. I have tweaked it so much over the years that at this point I am not sure of its origins. I do know that as far as the spices are concerned, I have adopted the blend used in the version they make at The Merc in Lawrence, where I teach. Pumpkin spice typically includes some permutation of cinnamon, ginger, nutmeg, allspice and cloves....cinnamon and ginger being the most commonly included. The loaf from The Merc is heavy handed on the nutmeg...and I love it. But you should of course feel free to reduce it if it is too strong for you. Also included in The Merc's loaf are a moderate amount of cinnamon and a relatively large quantity of cloves. Clove is another spice that I love, and it is almost always added in sparing pinches and other measly measures. Allspice and ginger have been left out entirely. The omission of ginger might seem strange to some, but it pleases me since it is my least favorite of the typical pumpkin spices. I had never intended to post this recipe. 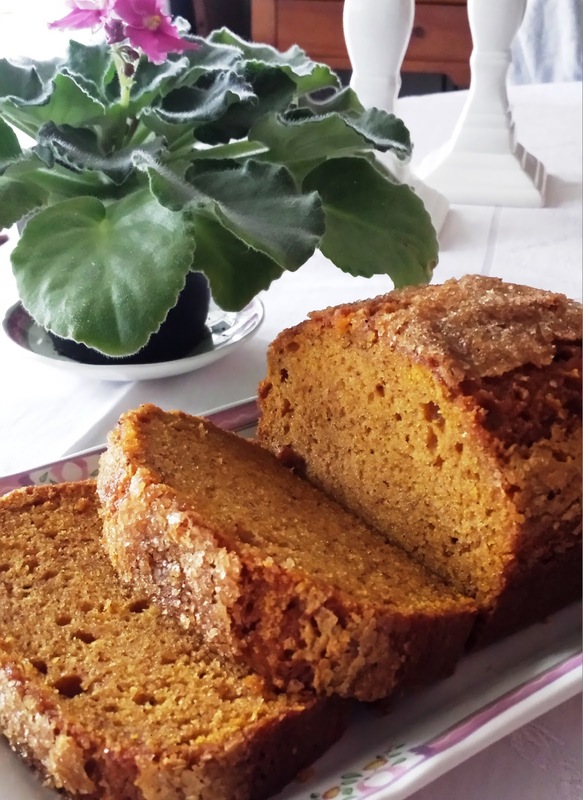 After all, there are few things more common than a recipe for old-fashioned pumpkin bread...you probably already have a favorite of your own. 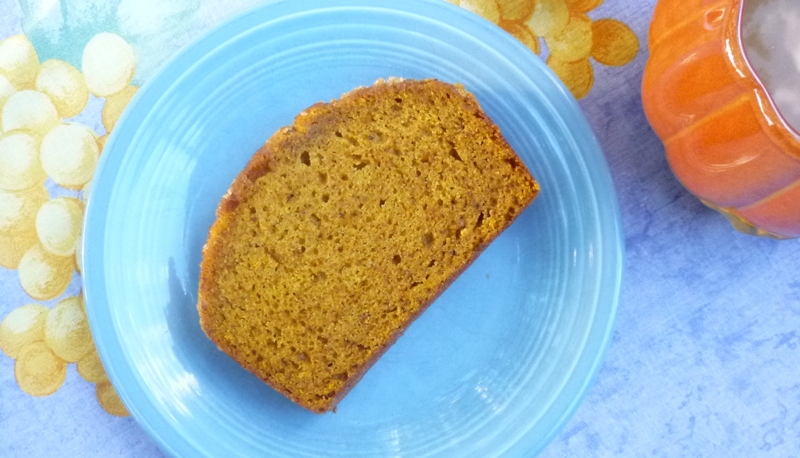 But as I have been enjoying this first loaf of the season, I realized that this is part of what this blog is for me: a place where I can share with as many people as possible the foods that I love—be they fancy or plain, complicated or simple. If you don't have a recipe for pumpkin bread that you love, I hope you will give this one a try...and I hope that you love it as much as I do. Combine the first six ingredients and set aside. Whisk the pumpkin, sugar and water together until smooth. Add the oil in a steady stream while whisking constantly. The mixture should emulsify and thicken slightly. Whisk in the eggs one at a time, adding each successive egg after the previous has been fully incorporated. Fold in the dry ingredients—mixing just until well combined. Turn the batter into two greased & floured loaf pans. If desired, sprinkle the loaves generously with turbinado (or other coarse) sugar. Bake at 350° (325° if using Pyrex pans) until a skewer comes out clean—about 1 hour to 1 hour and 10 minutes. Cool in the pans for 10 minutes. Turn the loaves out onto a rack and cool completely. Note: You may use either 6 or 8 cup loaf pans. A 6 cup pan will give you a tall, peaked loaf. An 8 cup will produce a low, gently mounded loaf. The loaf in the pictures was baked in an 8 cup pan. Thank you, thank you, thank you. In the world of blogging where posts are often of recipes with many, many ingredients, it is nice to see one that goes back to the basics. A well-done, simple recipe spans generations. This one looks like a keeper! Thank you Linda! I hesitated to post it...but I love it...and I think it's definitely a keeper!